Home > Basics of GM Foods > What are the Most Common GM Foods? There are a number of common genetically modified (GM) foods currently on the market. Depending on where you live and the labelling laws around GM foods, you might want to avoid some of these foods unless they are specifically labelled as being free of GM ingredients. At present, the two main types of GM crops being grown are ones that tolerate herbicides and ones that are toxic to certain kinds of pests. In the first case, a GM crop is engineered to tolerate a herbicide that kills all other plants and weeds. In this way, the GM crop does not have to compete with other plants for nutrients, water and light. The idea is that there will be higher yields from the GM crops if all other competing plants are eliminated. In the second example, a GM crop is engineered to produce a specific toxin that kills the pests who feed on it. This is commonly done for the cotton plant although some GM foods are also engineered to produce the toxin as well. Soybeans are a commonly modified food. One type from Monsanto is resistant to herbicides. The herbicide resistant gene is removed from bacteria and then inserted into soybeans. Corn is another common GM food. It is engineered to be resistant to specific pesticides and tolerates amounts that would typically affect the crop. Tomatoes are frequently genetically modified types of food, although the modification of tomatoes is somewhat different than some of the other crops. GM tomatoes will generally be engineered to maintain their quality for longer periods of time. 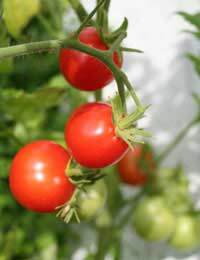 A tomato will be modified so that it does not have a substance that would cause non-GM tomatoes to become rotten and degraded. In this way, the process of genetic modification improves the quality of tomatoes and allows them to remain on shelves for longer periods of time while still staying fresh and appealing. Other commonly modified types of food include potatoes and rapeseed. Sugar cane is another GM food that is resistant to some pesticides. Sweet corn is one of the GM foods that produce a toxin that kills insects, which serves to reduce problems with pests. Yet another commonly modified food is rice. Rice has been called 'golden rice' due to it being modified to contain high levels of vitamin A. If you do choose to avoid GM foods, you can look for labels that cite that the food is free of GM techniques. Some supermarkets completely avoid the sales of any GM products, which means they are a good way to do all of your shopping in one place while ensuring you don't purchase GM products. Unfortunately, it is becoming more difficult to avoid GM foods in the sense that GM seeds are easily transferred into neighbouring farms. Organic farmers have become quite frustrated with the presence of GM seeds in their fields because it jeopardises their own organic designation and livelihood as organic farmers. For consumers, choosing to support or avoid GM foods is a personal decision. Whatever choice you make – whether you avoid common GM foods or not – try to ensure that the decision is an educated and informed one for your health and the environment. Hi there, There are several bold statements on your website that need cited references. You have referred frequently to the tomato with extended shelf life. Are you referring to the Flavr Savr Tomato? Because if you are, it was rejected by both the American and the British public in the 90's because it was tasteless and over the concerns it raised by directly consuming a GM fruit. Currently most GM crops are grown for processed foods, and animal feeds (except cotton obviously). There is now a GM sweetcorn on the shelves in the US, but this is a very recent development, and is being boycotted by more than one supermarket. There are still great concerns about the ingestion of the Bt toxin in foods, and also the huge amount of pesticides used to coat herbicide tolerant crops, which have obvious residues in the food that is then eaten. Golden rice is not commercially available yet- it is having endless problems in its field trials, because the yield etc is badly affected by the transformation process. It is still controversial as the money used to develop this product would have been better used to provide more children with vitamin A tablets, or better still, increase the availability of green leafy vegetables to balance diets and provide key micronutrients. This is another attempt to skew perceptions that GM can feed the world and save lives. It is utter nonsense. It takes political will and availability of land and water to help people out of nutritional poverty. GM is now an outdated technology that does nothing except provide a huge source of income for a few multinationals. Use of genetic marker assisted selection (MAS) and conventional breeding is making great strides in improving stress tolerant varieties and improved yields in staple crops without the controversy and risks associated with GM.